Photo Provided The VanDevender Student Art Exhibit will be on display during April at WesBanco Bank, 415 Market St., in downtown Parkersburg. The exhibit can be viewed during regular business hours of 9 a.m. to 3 p.m. Monday through Thursday and 9 a.m. to 4 p.m. Friday. PARKERSBURG — The VanDevender Student Art Exhibit will be on display during April at WesBanco Bank at 415 Market St. in downtown Parkersburg. The exhibit can be viewed during regular business hours of 9 a.m. to 3 p.m. Monday through Thursday and 9 a.m. to 4 p.m. on Friday. 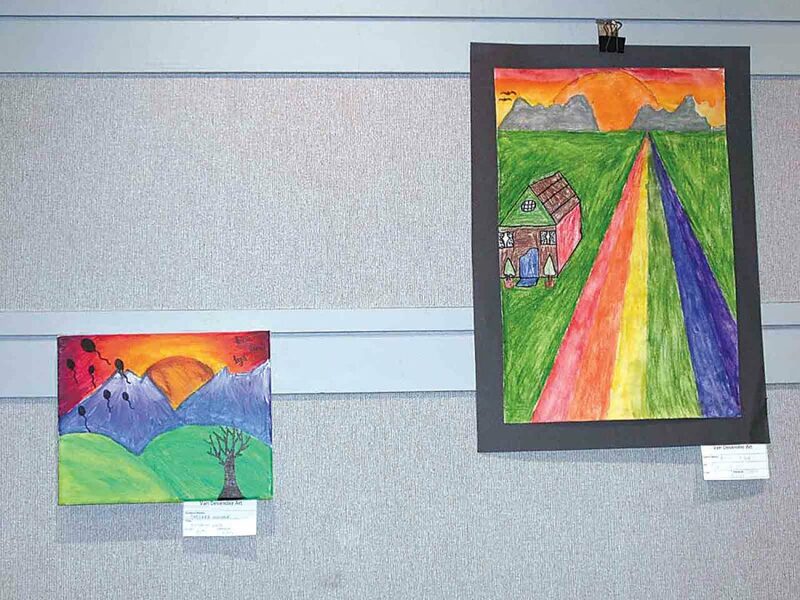 The VanDevender Middle School Art program will once again be the featured art work in April at WesBanco with a variety of work from the students. The Vandy art students are taught by their art teacher Heather Royer. “Our goal is for the students to develop foundation skills in the visual arts and we encourage critical thinking skills through self-reflection, problem-solving, critique and analysis,” said Royer. The exhibit displays multi-medium work of pencil (color and graphite), ink paintings, clay and tempera, acrylic, watercolor, chalk, oil pastel and metal. The sixth grade exhibitors are Madison Nicholson, Rebekah Hutson, Emily Winter and Suzy Lyons. The seventh grade students displaying their art work are Miranda Murphy, Crisstian Moyer, Nate McPeak, Dianna Wright, Alayna Liebau, Syncere Robinson, Johnathan Richter, Kaleb Dishong, Brian Kibet and Jeran Lucas. Eighth grade exhibitors are Kymber Wotring, Chelsea Swiger, Logan Angus, Austyn Ervin, Carlee Boyles, Chandler Randolph and Arianna Wilford.